Happy New Year's Eve! Do you have big plans? I'd love to hear about your fun evening. Us? We're staying home, having a taco night, watching basketball.....and loving it!! We've had extra kids here all week long so a night to ourselves will be nice. For Josey's next basketball practice, she's supposed to bring a note stating her strengths and weaknesses. I thought it would be a great time to send a thank you note along to give to Josey's coach. Coaches love to hear that praise and like to be recognized for what they do. They put a lot of time and effort into our kids, so be sure to let them know you appreciate them! Here's my card below. I was able to assemble this in about 10 minutes! I used my handy dandy Canon Selphy printer to print off a black and white photo of Josey's ball team and made it into a simple card. Then I used Just Rite Stamper's self inking stamps to create words arranged in a *ransom* style. I love the black and white colors and the inspiring words. A ribbon finishes off the outside of the card and I used a *thank you* sentiment from JustRite on the inside. Here's a closeup of the words, simply stamped on white cardstock and then cut into strips. Easy peasy but a pretty cool look. I think I'll be incorporating a lot more photos into my cards now that I have my little printer too. Until supplies are gone, Just Rite is offering these self inking stamps for just a buck! One buck, one smackaroo, 100 pennies!! I took my basket full of these little stampers and some notebook paper to Josey's basketball practice the other morning. It was the best entertainment for 6 little kids that I could think of and we never heard a peep out of them. They loved them!!! Check out the link to the Dollar Store section at Just Rite HERE. Hi everyone! I got myself out of cutting firewood today so I thought I better get busy doing something else. It's wayyyy too cold for this sun loving girl to be outside, no can do. I've been working on that birthday stash some more. Sorry for the photo below, this overcast weather has not been good for the photography sessions. Anyway, I used Karen Lockhart's Rose Bud Cupcake and paired it with a Papertrey birthday sentiment from the Birthday Basics set. Very simple focal point, but I fancied it up a bit with a Spellbinder's embossed rectangle and some glossy accents on the rose buds. I colore my image with Copic Sketch markers, using one solid red color...and then holding the Colorless Blender marker in the center of the flowers. This bleeds out the color to create a multi-tone effect. Ppaer is by Cosmo Cricket and ribbon snippets and buttons are from my stash. Base card is Papertrey Kraft cardstock with the edges inked in white ink. I've always been pretty good about sending out birthday cards, although I was late a lot of times this year. By having a nice stash to choose from, it's easy to just pull out a card, get it addressed and have it waiting to be mailed. Good plan. Note: Did you get some Copic markers for Christmas? Or perhaps you have a stash and still feel like you need a little help? Be sure to check our Marianne Walker's blog I Like Markers right HERE. Marianne has a ton of good information and offers step by step illustrations to help you out. Copics are the best markers out there and they truly add a whole new look to colored images. Good stuff. Hi everyone! I think I have a Christmas hangover. I've been working on Christmas projects, gifts, recipes, etc for so long that I don't know what to do with myself now! We had a wonderful holiday but I'm glad it's over now. I'm ready to start the new year off with a bang. A few days ago, I posted some basket tags that I made to get my organizing going. Today I made a new computer information notebook that will hold all of my family's favorite websites, passwords, website addresses, etc. You can see that my old notebook in the background was looking pretty shabby. My notebook was super easy to make. I simply cut my front and back pieces of cardstock to measure 4" x 6", which will match the size of the lined notecards I used for the guts of the book. I decorated my notebook front just like a card, using background papers from October Afternoon, velvet ribbon and dressed up buttons. I bound it all together using my Bind It All machine. You can see the inside of my book below, just simple, lined, 4" x 6" notecards. And here's a shot of the back, using some leftover October Afternoon patterned paper. The base cardstock of the front and back covers are Papertrey Kraft cardstock with the edges inked in white ink. For my fonts, I used Just Rite Stampers Brayton Font and rectangle wood stampers. Both of these sizes below come in one set so you get a good variety of font sizes. There's also a third size to round out the set. I used Versamagic Java ink to stamp my words. My circle image is cut out using a Spellbinder's Circle Die Template. I love that I always have just the right size of circle in my collection. And here's my journal sitting by my notepad basket that I rejuvenated the other day with some stamped tags, using the same Brayton font. You'll be seeing lots more organizational ideas from me.....I'm on a roll, baybee! Sale: Be sure to check out the JustRite blog for some great sales going on. You can get the details HERE. Saying it's cold outside is an understatement! It's bitterly cold. The wind bites your face. Just nasty cold. That's all the more reason I sooo appreciate my nice warm home, my fireplace and the table Jordan set up with a Thomas Kincaide puzzle. Nothing like being at home for the holidays! I put together this card last night while thinking about the cold. The adorable stamp is one of Anna's cute designs from Whipper Snapper. This card was near impossible to photo because of all the muted colors and shimmery color. I stamped the image onto PTI Kraft Cardstock and then colored it with Copic markers. The muted colors you get when color on Kraft Cardstock really gives a vintage look that I love. 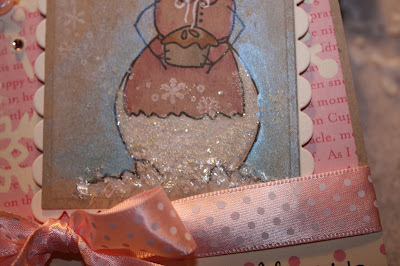 I added a lot of shimmery details to my card......Perfect Pearls around the snow woman image, new Vintage Glass Glitter that I got from my friend Cindy at Star Lit Studio(the shimmer you get is amazing!) and big chunky Martha Stewart snow glitter along the ground line to resemble a pile of snow. Zoom in below and you can probably see it better. For the card base, I used Kraft Cardstock and some new October Afternoon pink snow paper that I got from Star Lit Studio. Cindy's getting a wonderful selection of the hard to find October Afternoon paper. 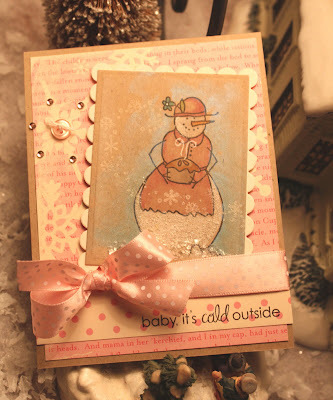 I finished the card off with Spellbinder's rectangle mats for the main image, Papertrey Sweet Blush Swiss Dot Ribbon and some pink, shiny sequins on the snowflake. I think the sentiment and snowflakes from Pine's Papertrey Snowfall stamp set finishes the card off perfectly. This will be a great card to use after the first of the year....the holidays will be over but the cold will still be here! At this time of year, I totally get overwhelmed with all the Christmas clutter in my house. The tree, the presents, the village.....the wrapping paper area........giant, opened Christmas decoration tubs......snow suits, gloves,mittens and boots.......I know you're right there with me. Today, I just had to take a break and get an early start on my organizing goal for the new year. I started cleaning and purging and it felt good!! One of the best things I think you can do when organizing is to label stuff. I find that if I have label on baskets, etc that I tend to put only those items in that particular basket. I started out with my computer desk area and made a label for a wire basket that holds note pads. I seemed to have had this little problem a few years back that involved purchasing dozens and dozens of note pads. It all falls back to the love of office supply items and I know many of you can relate. I stuffed as many notepads into my basket that I could and neatly gathered up the rest for refills and stored them away. You only need so many note pads, right. Then I found an empty Longaberger basket and decided to fill it with lip gloss. Jordan has this little fettish that she cannot go without lip gloss/balms. If she gets dry lips, she licks them and gets this red ring around her mouth. She's obsessive about it and even freaks a little if she can't find a lip gloss. At the moment, she has this gihugic tube of lip gloss that is on a string. She wears it around her neck constantly. So I thought I would surprise her with a basket full of lip glosses that will be full at all times. Hopefully she will just use some and return it to the basket. I might have to make one of these for my nightstand that has my lip balm and hand lotions. Little by little, I'm going to get organized next year. Baby steps...baby steps...baby steps. I will conquer! Okay, here's what I did for the little tags. I stamped my words with Just Rite Stampers' Brayton Font, using a small wooden stamper. I love this font, it will go great with all my labels I intend to make. 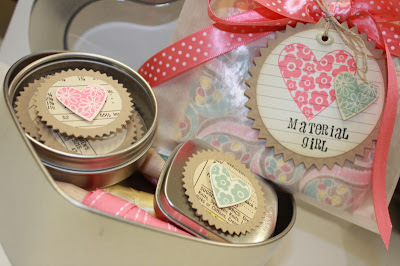 I cut out my circles and embossed them with a small Spellbinder's circle die template. I then used pop dots to adhere the circles to a circle cut out with a Spellbinder's Pinking Die. 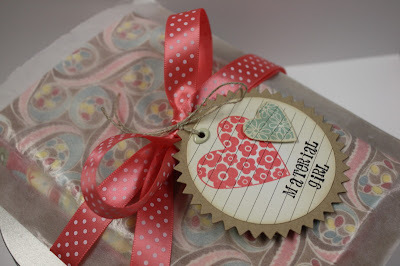 They remind me of little vintage tags and the polka dot ribbon from Papertrey is the perfect finishing touch. Do you have big plans for organizing in the upcoming year? I have visions of a more organized house and am really excited about it. It feels soooooo good to be clutter free. I've got a long way to go but I will get there. Gotta get Christmas out of the way first! Have a great day everyone! Note: The cookie trays I made in yesterday's post are simply paper plates that I had in my stash from years ago. They are about 6" square. And I bake my cookies then freeze them in all kinds of Tupperware, Cool Whip containers, tins, etc. When I'm ready to give out my cookie trays, I bring out all the frozen cookies and start assembling the plates. Then I wrap them with plastic wrap.....some I give out right then and some I put back into the freezer so they will be ready at a moment's notice. Hope that helps! This year I've baked more Christmas cookies than ever before. I decided to do my baking early and I got tons of cookies put up in the freezer. I give the cookie trays away as I think of people to give them to....like the bus drivers, the mail lady, neighbors, coaches, etc. I've given away so many little plates that I have to keep making more and more cookies. Great gifts though and I've enjoyed all the baking this year. I made up a bunch of simple tags to tape on the top of the plastic wrapped plates. Super easy to make. I used the Baking Stamp Ensemble from Just Rite Stampers for the border and center to make the perfect tags for my plates. The stamped images were cut and embossed with a large Spellbinders circle die template. I paired the tags up with some October Afternoon Christmas paper, Papertrey Kraft cardstock and Vintage Cream twill ribbon. Here's a little glimpse of my cookies this year, I tried lots of new recipes from a Better Homes and Garden cookie magazine. I simply used little holiday plates and then double wrapped my cookies with plastic wrap. I attached the tags with Scotch tape on the backs. I gave away lots right away after baking and some went back into the freezer for when I see people next. Hope your holiday season is going great! The girls are officially on Winter Break so I hope to wind down on my Christmas projects soon. Edit: For my pocket Christmas cards, I simply folded a half sheet of cardstock in half, trimmed a little off the top of one side and sewed around 3 sides to make a pocket. I trimmed an insert to fit inside and added a computer generated holiday sentiment and a small family photo. Embellishments are from Papertrey Ink. Edit: Alicia asked if I would recommend using the Canon Selphy home printer to print out all my photos for scrapbooking. Let me first say that I love the quality of the photos and have gotten lots of questions about how did I get 4 to a page, and that the quality looks great. For me personally, the answer is no to printing out all the photos though. It really depends on how you scrapbook. If you only scrapbook 1 photo to a page, maybe this would be for you. But when I scrapbook, I usually do (2) 12" x 12" layouts and have 5-8 photos for each layout. And I take a LOT of photos. So I'm going to save my biggest print jobs for Shutterfly or my local photo shop. I definitely have been using my Selfy for my Daily December pages and will continue to use it for mini albums, etc. I love, love, love it and highly recommend it. And the folk at Canon are THE BEST for customer service.....they are in the USA, I can understand them and they are sooo helpful! Hi everyone, what's on your list today? I was chatting with some friends about how the countdown is on. 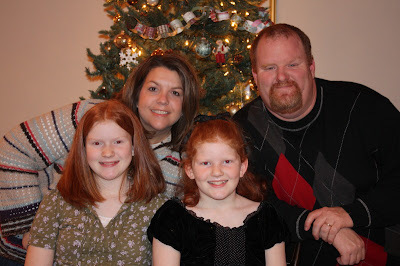 One week til Christmas and I want to enjoy the Christmas break with my family. I want to have everything wrapped up and ready to go so that I can enjoy the true meaning of Christmas and just *be*. Nothing else but reading a good book, playing games and drinking hot cocoa, watching movies, etc. The stuff that childhoods are made of. But to accomplish that goal, I've had to keep busy to get everything checked off my list. I issued myself and my friends, and now you, the Thirty Minute Challenge. Make your list, keep it handy, and allow yourself 20-30 minutes tops to work on one selected task. This helps you to not spend all day piddling around on the computer, etc. Yesterday I took the time to make one last batch of cookies for holiday trays. While I had the timer set for 35 minutes, I printed off my family Christmas photo for this year and addressed all the envelopes. I got them all done by the time the buzzer went off on the stove. If you recall, I had all of my Christmas cards finished back in the fall when Nichole issued the design team a challenge. Thank goodness I took the time to make those 25 cards back when I had time! I tweaked my card design but here's the simplified version of my Christmas cards this year. I cannot stress enough how much I looooove my Canon Selphy printer. It was an early Christmas gift and it's probably one of the best gifts/tools I've gotten. I didn't have time to get online and finish up my photos and I didn't want to stand in line at Wal Mart. So I just put 4 photos to a page and printed them off at home. Easy peasy! Here's another 30 minute task I did...little Christmas thank yous for the girls to write out. Yes, we DO still write thank yous. I insist. No, a phone call won't do. I grabbed some precut SU! scallop notecards because I wanted quick and easy. I cut some K and Company patterned paper to put on the front of the cards and used scraps to put strips on the small envelopes. I used Just Rite's thank you center and border from the Designer Borders and Centers set. I stamped the images with Java Versamagic ink, let them dry a little bit and then punched them out with a SU! scallop punch. Again, easy peasy and quick! 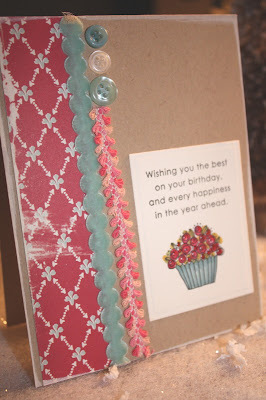 I edged all the scallops on the sentiment part and cards with white ink. I grabbed some velvet ribbon from my May Arts collection (available from Cindy at Star Lit Studio) and glued it on, then added a few staples to secure the edges. I got seven little thank you notes done in that 30 minute time frame and even had time to put away my supplies. Thank you notes, CHECK!! Now I'm going to move on to some laundry and picking up the house. You can do it girls, these 30 minutes tasks make a world of difference! Labels: Canon Selphy Printer, Christmas, JustRite, K and Co.
Hi everyone, are you all knee deep in snow and/or the holiday hustle bustle? I got some major stuff crossed off my list.....Christmas cards done and lots of cookie trays in the freezer today. Still lots more to do so I'm going to post and run. Are you all holding up? Are ya getting stressed? Don't let it get to you...find a good book, stamp for just the fun of it, do a little sewing, drink a little(or large) margarita!!! Today I have another birthday card to add to my stash. 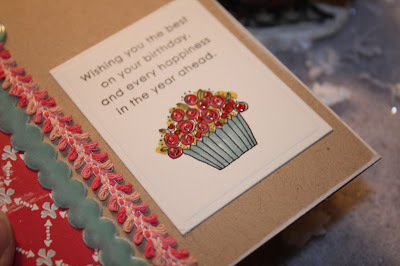 I used Karen Lockhart's pretty Tulip stamp, keeping with my red color scheme that I'm liking right now. I think I used My Mind's Eye patterned paper but I couldn't find the label. I colored the tulips with Copic Markers using the fine tip of the Sketch Markers. For the vase, I colored the vase solid, added a little shading with a darker marker, then used the Colorless Blender to make dots. Very fun technique to use with your Sketch Markers. I then cut and layered my image with Spellbinder's Square and Scallop Square Dies. Sentiments are from Papertrey Ink and I finished off the card with 3 pearl sequin stickers. If you zoom in, you can see that I added some Ranger Glossy Accents to the tulips in little droplets. Makes the flowers look like they're wet or dew covered. I fancied up the inside of the card with some scrap patterned paper and a Happy Birthday sentiment. Back to my margarita.......(I wish)......have a great day everyone! We had a snow day today! I think everyone remembers how much you loved a snow day from your childhood days. My girls were super excited. They dug out the snow clothes (of course everything is mixy matchy because you just wear what fits, right?) and decided to shovel the driveway. That didn't last long and they headed off to play on the swing set. Love those rosy cheeks. Good day for cocoa, marshmallows and huge dollops of Cool Whip...and wet snow clothes scattered all over the house for Mom to pick up. And sitting by the fire, looking at the beautifully decorated Christmas tree, being thankful that we have a nice, warm home. And after I shipped the girls off to Grandma's house, I stamped! That was, after we sang *Grandma got ran over by a reindeer*. We danced and laughed at the thought of poor ol' Grandma getting run over on her way to pick up the girls!! Onto my card, I'm winding down on my Christmas cards but I'm still into the Christmas colors. So I opted for red today(kinda easing into Valentine colors), using Karen Lockhart's Itty Bitty Birds. I colored the image with Copic markers, using my Colorless Blender on the birds' stomach areas. Images were cut and layered with Spellbinder's Long Rectangle Dies. Sentiment and ribbon is from Papertrey Ink. Patterned papers from My Mind's Eye and Cosmo Cricket. For a finishing touch, I used an oval acrylic sticker and cut a little flag for the sentiment. It's nice to add a few more cards to my regular stash and perhaps get a head start on next year's birthday cards. Hope you're enjoying the wintry weather if it's in your neighborhood. I really don't like the cold but I'm having a change of heart about winter....gotta love all the seasons as they come and go. Edit: The Moda line of fabric is called Posh. The link is HERE for you to view. I don't have time to take photos of my actual fabrics cuz I'm out the door in a few minutes for a weekend full of basketball and company Christmas parties. Have a great weekend everyone! 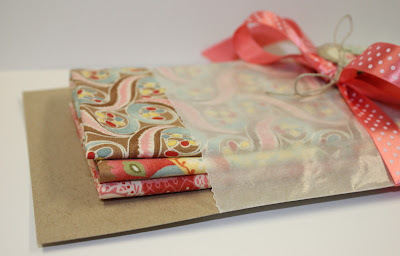 You're in for a treat because all of the Papertrey designers have Valentine treats to show you! Check out Nichole's blog to see more goodies! I know we're still Christmas mode but Valentine's Day will roll around quicker than you think. I've already got some great ideas for gifts and it's always nice to be prepared in advance. My treat for today is for a special someone that likes paper crafting AND sewing! I've designed a super fun, adorable kit that I've named *Material Girl*...get it? Material....like fabric. I knew you would. 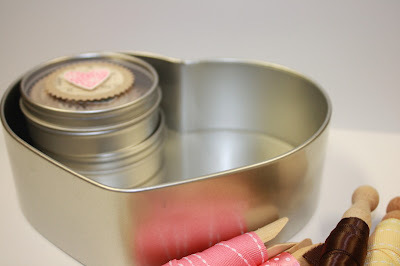 I'm packaging all my goodies into a Large Heart Tin with Clear Top from Papertrey. I didn't realize how much you could tuck into these adorable shaped tins. You need some for Valentine's Day gifts, trust me! Let's start first on some fun embellishments that I created. I could just gobble these up and I know you'll love them too. This month at Papertrey, Nichole is releasing a brand new set called Heart Prints. There are two sizes of hearts and guess what? 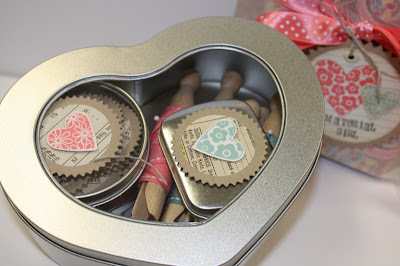 They have 2 coordinating punches plus a coordinating sentiment stamp set. The designs in the various hearts are super cute, even more cute when you stamp them in fun ink colors. Here's what I did for the embellishments. I wanted to keep with my sewing theme so I cut some pinked circles using the Spellbinder's Pinking Circles Dies with Kraft Cardstock. I then punched our circles of pattern paper. Not patterned paper, this is actual paper from a sewing pattern. See the photo above? I just cut the back of some old patterns that I found at garage sales and punched circles. All of the circles look vintage because the paper is old and discolored. And each circle has some sort of fabric measurements or little pictures of dresses, etc. So cute! I then took the smallest hearts from the Heart Print set and stamped them with Berry Sorbet and Ocean Tides ink. Then I just punched them out and adhered them the circles with pop dots. 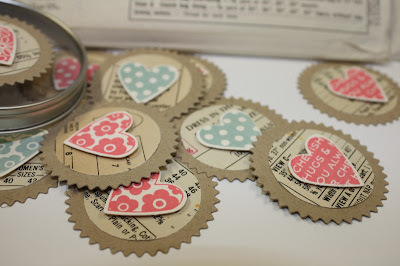 These will make adorable embellishments for Valentine cards, tags, bags, etc. I layered them all into clear top, round PTI tins. Stay tuned for projects using these embellishments come Valentine time. 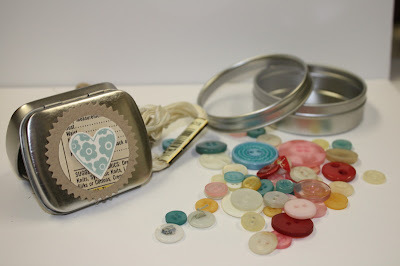 I then grabbed two more tins from my Papertrey stash and filled one with colorful buttons and one with embroidery floss. 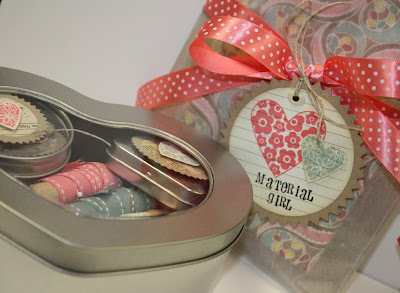 I added one of my heart embellishments to the tin lids. Of course I couldn't forget about the ribbon. I cut a couple feet from spools of Berry Sorbet, Dark Chocolate, Ocean Tides, Vintage Cream and some old lace. I used clothespins that I find at dollar stores to wrap the ribbon on and then secure with straight pins. Okay, now comes the fun part....packaging up the goodies in the big heart tins. This part totally reminds me of a red Tupperware lunch box I had as a child. It was brand new (rare that we got something brand new when we were young) and it had 3-4 little containers that nestled into the lunch box just perfectly. I loved that thing, anyone have one too? Okay, I digressed but here we go with the packaging. 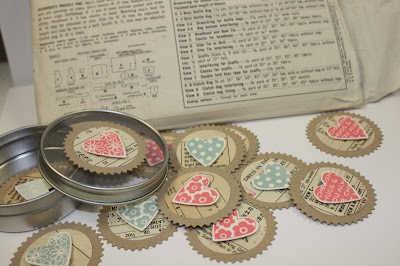 Nestle in the two round tins that have the buttons and the heart embellishments. 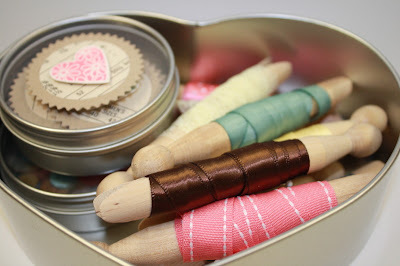 Then layer in the ribbon spools that are on the wooden clothespins. Then on the top goes the tin with the embroidery floss. This all nestles in perfectly, with the clear heart lid letting all the goodies peek through. Now onto the next part of my gift....fat quarters of FABRIC. Fat quarters are cuts of fabric that measure 18" x 22" and come neatly folded when you see them in the fabric stores. I picked up three fatties from a Moda(my favorite fabrics) collection that I think will be fabulous for Valentine's Day. The fabric colors are what drew my inspiration for the buttons, ribbons, etc. To package up the three fat quarters, I slid them into a Large Glassine Sack. If you cut a piece of cardstock to fit in the sack, it helps keep the sack more sturdy. Using a long piece of Berry Sorbet Swiss Dot ribbon, I tied a bow around my fabric package. 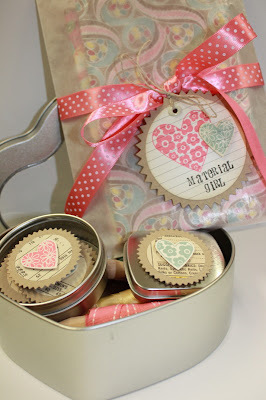 Then I added a tag using a larger Spellbinder's Pinking Circle, a lined recipe card and both sizes of hearts from Heart Prints. I inked the edges with Ranger Distress Inks to add a vintage look like the old pattern paper has. I stamped *Material Girl* with an alphabet stamp in black ink. Then all you gotta do is present this adorable gift to a fun loving friend and you're good to go! I think I might actually keep this first kit for myself and invite a friend over to make Valentine cards together. That will be THE perfect event in January once the holidays are over and we're all settled in for winter. I hope you love my gift idea as much as I do. Be sure to check out all the other designers' sweet Valentine ideas as well. Check out Nichole's blog for even more fun. 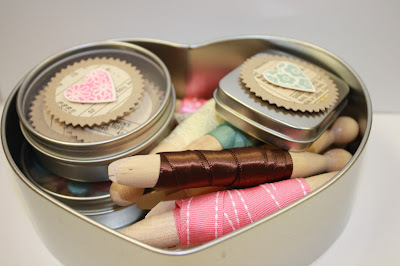 And don't forget to stock up on the heart tins and some of the others I've used for packaging. I think they'll be great for all those Valentine goodies. And one last thing, don't forget to join the Release Party at the Papertrey Ink Forums Sunday night. The release for December is the 15th(midnight on the 14th). Rib-N-Strips, come and get em'! Edit: Thank you for all the great comments about my Rib-N-Strips. Unfortunately the Scor-Tape is out in both sizes at Papertrey. Nichole just let me know that a new shipment should be arriving next week, so keep checking. I'll try to give a head's up to you here on my blog too. I love it when my Papertrey goody box comes each month. The first thing I do is dig out the ribbon spools. There is such a fun variety of colors, textures and styles that I nearly start drooling right there on the spot. 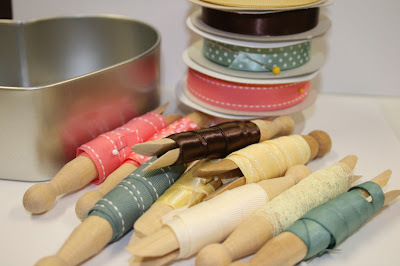 When I'm gathering supplies for my projects, I almost always reach for Papertrey's coordinating ribbon colors. They add texture, dimension and such a nice finishing touch to projects. Today though, I'm putting the ribbon front and center. Check out what I have up my sleeve today! Let's get right to the project, shall we? Start by gathering up some fun colors of Papertrey Perfect Match Exclusive Ribbon. I'm using a variety of Sweet Blush, Dark Chocolate, Spring Moss, Spring Rain and Ripe Avocado. Scor-Tape is an amazing product. It is a premium double sided adhesive, best on the market, acid free, heat resistant and incredibly sticky tape. It can be used with embossing powders, foils, beads, glitter, ribbon etc. It is the perfect permanent adhesive for card making, boxes, books and especially our exclusive My Timeless Templates line! We carry this tape in two widths, 1/4" & 1/2". This is good stuff folks, you won't be disappointed. Begin your project by cutting a piece of cardstock (I'm using PTI Kraft) to 4.25" x 5.5". Lay this on a craft mat...the Teflon surface helps to peel the tape off very easily. Adhere strips of 1/2" Scor-Tape over the entire surface of the cardstock piece as shown below. The tape edges will extend beyond the piece of cardstock and will adhere to the craft mat. Below is the cardstock, completely covered with Scor-Tape. Peel off the sticky backing of the Scor-Tape. Next, cut strips of ribbon a little longer than the width of the cardstock. Place the ribbon strips horizontally all the way down the cardstock. You'll end up with a completely ribbon covered piece of cardstock. It's pretty already, isn't it? Peel the cardstock off of the craft mat and turn upside down on a cutting mat. (I'm putting my quilting supplies to good use here). Using a clear ruler and rotary cutter, trim off any excess ribbon. Turn your piece over and now you're left with all straight edges. Using a rotary cutter, clear ruler and craft mat, cut the ribbon covered cardstock into strips. You want to cut the opposite way that your ribbon lays....so if your ribbon lays horizontal, make vertical cuts. You can cut the strips into any width you desire. I used 1" and 1/2" strips. Now you have what I've lovingly named "Rib-N-Strips". Kind of like Chicken Strips or Riblets...fun little morslets of ribbon that you can pile high in a basket...and gobble up on all your projects!! And of course, I had to play with my Rib-N-Strips. Here's a few cards I whipped up using Papertrey's Wise Owl and Paper Tray stamp set. I used a combination of stems, flowers and leaves to make some fun cards. Base card is Papertrey Stamper's Select White, then Kraft and Dark Chocolate. Ink colors are Ripe Avocado, Sweet Blush and Spring Rain. Here's a close up shot of the Rib-N-Strips. I was pleased that there was not a lot of fraying of the ribbon. I think that when the strips are cut with the rotary cutter, it pushes the ribbon edges into the Scor-Tape, giving the ribbon a nice sealed edge. Be careful though as I'm sure if you handle the Rib-N-Strips too much the edges might fray. I used Scor-Tape again to adhere the Rib-N-Strips to my projects. There you go! ORDER UP!! Come and get your Rib-N-Strips! (insert ringing dinner bell here). I hope you've enjoyed my project! Be sure to send me your links if you give them a try! !